Motor Man and I spent July 4 at the Outer Banks. I readily admit that I had serious doubts about driving there on a weekend, especially a holiday weekend. But once we got ON the beach, what a wonderful day we had: sunny skies with puffy white clouds, temps in the mid 80’s and a wonderful breeze. It was a windows-down kind of day. Add horses to that mix, and the day was just about perfect. What a treat this was! 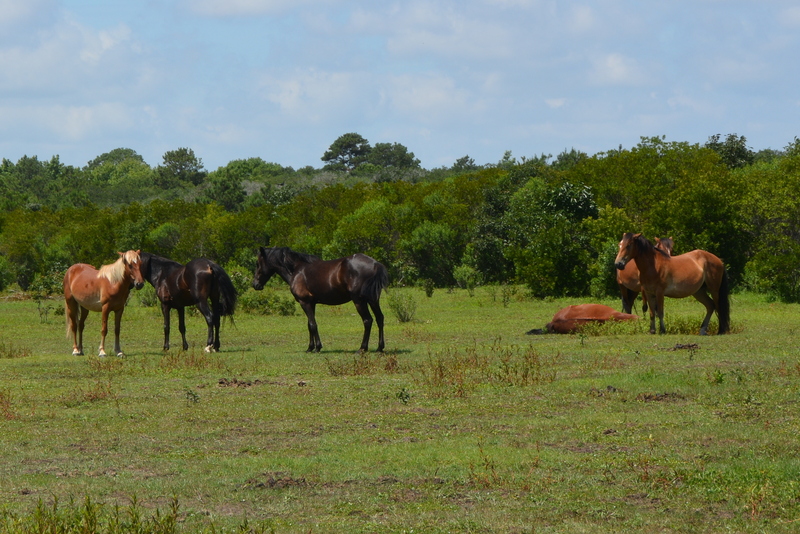 In this semi-secluded location, we saw a total of 21 horses. Look at that beauty on the far left with the “highlights” in her mane. We most certainly were NOT the only folks on the beach. And although I love photographing “my” horses, this is perhaps my favorite picture taken that day. I should have known that Motor Man would make the day fun – even having to deal with holiday traffic. Oh, and that five mile stretch that took so long to travel Saturday morning? We made the return trip that afternoon in 12 minutes. 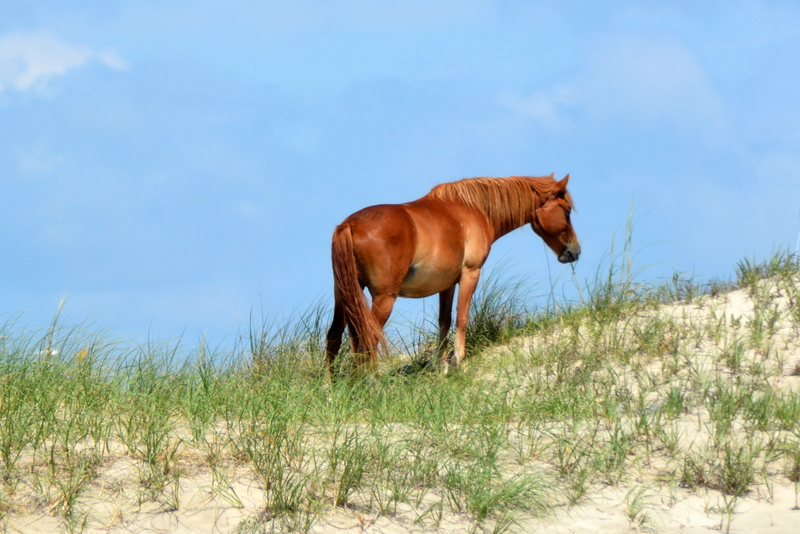 This entry was posted in Family, OBX Wild Horses, Traveling Days and tagged 4th of july, corolla wild horses, outer banks. Bookmark the permalink. Sounds and looks like an ideal 4th. Love the horse pix of course but I think that last one with the flag is truly a perfect way to sum up Independence Day! 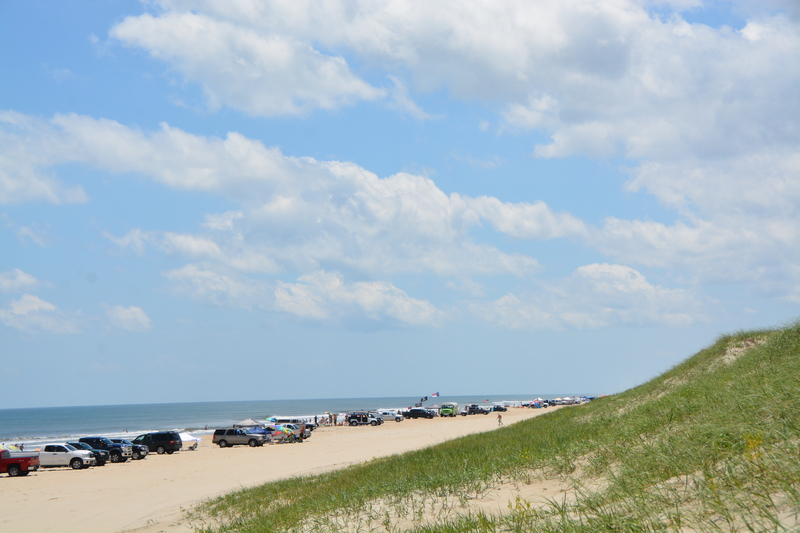 I thought about you over the weekend and wondered if the weather was nice enough for you to visit the outer banks. We’ve suffered constant thunderstorms. It finally cleared off yesterday and we actually had sunshine for quite a few hours. So I was worried for naught (even though I knew Jr. would make a bad time a party). These pictures are beautiful. What a memorable 4th! That’s my favorite pic too! Long drive time – part of adventure!!! Love your photos of the day. My favorite, or course, is the flag. What a perfect weekend, other than the traffic of course. I think that is my favorite picture as well of this group. What a fun time. Thanks for sharing. Perfect way to celebrate our country’s birthday! And looks like the horses were joining in the party. 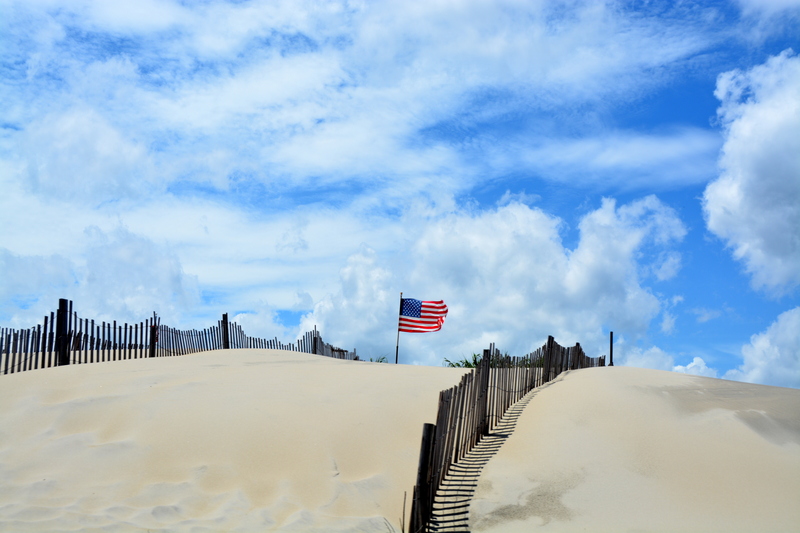 Who wouldn’t love the picture of the flag on the beach??! Lovely way to spend the 4th. Freedom on the beach, what could be better? I found it interesting that parking is right on the beach! Great photos, as always. It looks like a great way to spend a holiday. What a wonderful way to spend the 4th – with your special “other” and your favorite horses. The photo of the flag is fantastic too. Gorgeous!!! I just live getting to know this little corner of our country with you – and learning more about the horses too! That first and last shot make a stunning pair – horse and flag against that perfect blue sky! Sounds like you made out ok with the traffic! & I’d say it was worth the trip – & that is a great new flag pic ! What a wonderful 4th of July! I agree with everyone about the flag on the beach picture, wonderful! Of course I always love the horse pictures I would say the trip down was worth the wait. I’m glad the return trip was much better for you. Nice flag shot. And horse shots. Love that light mane. It looks funny to me to see cars parked on the beach.